This is your Premier League table of bars. UK rap and football have enjoyed a history of brotherly proportions. From Yannick Bolasie and Bradley Wright-Phillips sparring against each other on classic ‘Lord of the Mics‘ sets, right through to the likes of Jesse Lingard and Marcus Rashford being boys with Stormzy and Not3s in 2018, the two worlds continue to come closer together. With most UK Rappers having kicked ball growing up, and most footballer’s car stereos regularly heard blasting out the latest Yxng Bane or MIST on the way to training, the two worlds now enjoy a relationship that is firmly joined at the hip. Nowadays, you’d find it difficult to listen to a new Mixtape Madness exclusive and not hear a football-related rhyme. 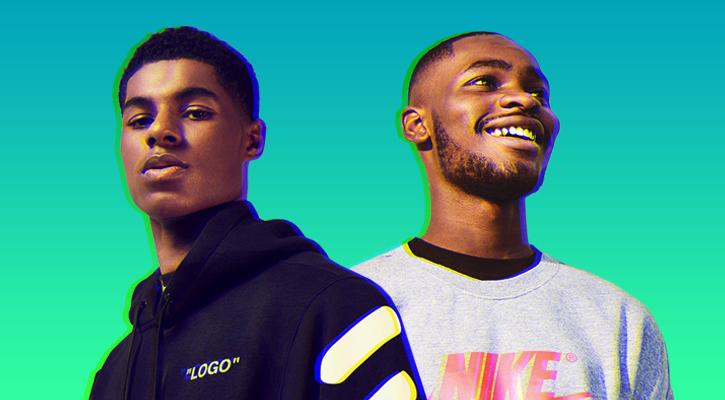 With DigDat, Headie One and KO leading the new gen and following on from the likes of Dave and AJ Tracey’s lyrical antics in the last few years, UK rappers have relentlessly reeled off baller-inspired bars over the years. There’s now so much football-themed point-scoring you could comprise an entire UK Rap league table of lyrics. So with that being said, we’ve rounded up 50 of the best football-inspired bars from grime, drill and UK rap for you to run through. Wretch’s lyricism has never been in question, much like his fervent support of the Gunners. Here, he lists off three teams and his own allegiance in quick succession before breaking down former Arsenal player Oxlade-Chamberlain’s name with a clever double entendre. One of the first freestyles that put MIST on to a mainstream audience, MIST revealed who he supports with clever wordplay that also encompasses Steve Austin and his street status. Up there with his best bars. More visceral grittiness from CAS, who spits his archetypal greaze by comparing the Tory party’s politics to the ex-Manchester United winger’s on-field position. Dave concludes ‘Attitude’ by listing off motor brands alongside a host of players “named because the cars are from their country”. The track which propelled Headie to mainstream success contains his now iconic reference to Liverpool’s Egyptian King, comparing his potency on the mic to Mo’s goal-scoring prowess. Clever wordplay from P, who reflects about life on the roads by reeling off a host of references to players and old mobile phones (Eriksen/Ericcson) from his least favourite team in the league. While Victor Wanyama has taken fair few Ls in his time as a Spurs player, including his name in a bar takes tekkers, with AJ comparing Spurs’ holding midfielder’s defensive ability to how he blocks taking Ls. Kam’s wordplay and flow stays incredibly on point throughout this one, and he’s the only guy on this list who can reel off this bar with conviction and honesty, when he refers to Ryan Giggs’ infamous off-field antics to his own lifestyle, where he regularly tears up shows after playing professional football for Dagenham & Redbridge. One of the first songs that put Big Mike on the map coincided with the departure of his favourite team’s worst-ever manager, who endured a train-wreck of an experience at Old Trafford. Arguably the best bars from one of young Santan’s strongest verses, Dave compares leaving rival MCs in “states” to Kaka’s move to the MLS with Orlando City. Covering both the worlds of football and Dragon Ball Z, Lyrical Streezy demonstrates YGG’s attacking potency on the mic in this sick freestyle. 23 compared he and his team’s brotherhood to two of the best siblings to ever kick ball: Kolo and Yaya Toure. AJ draws parallels with how quickly he chases cheques to Pierre-Emerick Aubameyang’s searing pace. This purely makes the cut due to the mention of a legend from the yesteryears of the Prem. Those old enough to watch 90’s ‘Prem Years’ will understand the power of a Jimmy-Floyd thunderbolt. Dave compares how close anyone beefing with him on roads is to the usual protocol of how you take your 5-a-side pens. Genius. Skepta’s not exactly renowned for his football bars – he doesn’t even support a team – but this surprise bar from back in the day references Giggs’ one-team-man antics with Manchester United as well as Thierry Henry’s decision to leave Arsenal for Barcelona. Big Mike addressed the comment that every basic lad still leaves under his posts by comparing himself to United striker Romelu Lukaku. KO alludes to his oppopents taking bullets like goalies deal with shots if he is to let his strap “sneeze” on this sick link up with Unknown T.
Dave’s progressed massively since bursting onto the scene back in 2016, with this bar comparing the growl of a BMW motor to the Liverpool manager’s occasionally-prickly nature. More gems from Headie, who compares his efficiency in moving weight to Zidane’s infamous dismissal in 2006 with a sly Frosties reference. Renowned for backing United to the hilt, Youngs work rate when it comes to reeling off football bars is reminiscent of Rooney in his prime. Hailing from the blue borough of Lewisham, Strapzy, under his Dru Blu alias, features one of the least and most successful figures in the game in just a few bars. A slick play on words from Merky, who riffs on the best individual award a player can win in the game alongside the high fashion brand and his choice of trousers. Headie’s work rate this year has been similar to the Italian midfield general’s in his AC Milan days, with this collab with Kenny Allstar a certified percy. AJ illustrates his control of the music game by comparing it to ex-FIFA boss Sepp Blatter, which will probably be the first and only time Sepp will be mentioned in a grime bar. The third in a week-long series of responses to Bugzy Malone’s “Relegation Riddim,” Chip references United’s treble-winning antics back in 1999 to claim victory over Bugzy. Kam is a diehard Leicester fan, which explains his shout out of Vardy’s infamous Facebook status from before he ripped up the Prem with the Foxes. Stellar wordplay from another Adenuga who isn’t really renowned for his love of football, shouting out Sherringham (sharing ’em) and Wilshere (will share). Clad in an England shirt while playing FIFA with his “Spanish girl” in a Columbia kit, Dave alludes to Jose’s tenures at both the Blues and the Nezzazzuri. Big Fris shelling back in 2009, when Gerrard was in his Liverpool prime and Wellard was still the Eastenders dog. Serious throwback. Shouting out clinical strikers from times past and present, Headie has fast become one of UK Rap’s deadliest frontmen, particularly when unleashing bars like this. We all know Gerrard had some serious power in the glut of long range goals he scored down the years, with Sam Wise likening his shooters’ strike rate to Stevie G’s. Saving one of the best til last in the “Next Up,” S1 compares his skill out avoiding the police on road to the PSG talisman. Riffing off Kante’s first name with “and go low” (N’Golo), it’s double entendres like this that make Dave’s football references up there with the very best. We all know CR7’s iconic free kick technique has that notorious dip, with C1 stating that anyone that talks dirt on his name will face the consequences. RV compares his ability to assist with dealing with opps to the Arsenal midfielders playmaking antics. T Mula explains this one himself in this bar, which shouts out a manager in Jose Mourinho who may not be “managing it” for much longer. DigDat states that he’s really out here, comparing his weapon arsenal “on the field” is as strong as one of the game’s best-ever players. A pair of football references from Zuu comparing his work on the roads to that of tireless German full back Joshua Kimmich, and comparing his OG status to Nemanja Vidic – one of the Prem’s best-ever centre backs. Referencing Beckham and Ferguson’s infamous dressing room bust-up, Merky says that his enemies will be getting the same treatment as Becks did from Sir Alex back in the day. Penning a song in the name of the young striker when he first started making his breakthrough, Youngs compares his young bulls to the Rashford, who is now an established Prem player. KO’s wordplay is some of the best in drill at the minute, here breaking up “Liverpool” into “Leave a pool”, illustrating that he’ll leave the scene red. Alexandre Pato was once one of European football’s biggest prospects – and Dave compares the future of young kids out on the road to Pato’s now-plateaued career. Not a complicated one here: Devlin compares easing off with a spliff to the highs of England’s heroics in ’66. Here, AJ compares his speed with a strap to electric Roma winger Mohamed El Shaarawy’s ability to skip pass defenders and score. DigDat has often been compared to the Mbappe of the drill scene – and here he talks about the meticulous planning that goes into making his money. Some straight greazy freestyling from Eyez over that classic “Ante Up” beat, who produces probably the only sexual ineundo Tottenham Hostpur with ever recieve in a set of bars. The whole of this freestyle is full of some of the coldest football wordplay you’ll hear, but this bar is a particular stand out. Make sure you listen out for the Dickov and Wanchope bars too! Dave’s 18-year-old shooter has the same hairstyle that Marcus Rashford had at the same age before firing his way to getting the club’s number 10 jersey this season.